we offer our petitions to you. and merit the rewards of eternal life. Amen. splendid example of charity, we hail and invoke thee. through the merits of our Lord Jesus Christ. Amen. O God, Who has given us in Thy Humble Son, our Lord Jesus Christ, the model of all virtue and perfection, grant to us the virtue of humility. We think so little of Thee because we are so full of self. We cannot love Thee more until humility shows us our own nothingness and makes us rejoice in our complete dependence upon Thee. 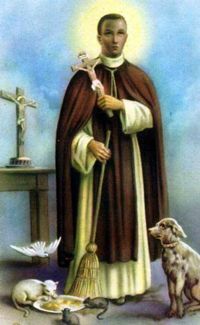 You have given to the world a glorious apostle of humility, St Martin de Porres. Guide us by his example and strengthen us through his intercessions in our efforts to conform our hearts to the humble Heart of Thy Crucified Son. Renew, O Lord, in these days, when pride and forgetfulness of Thee are so widespread, the wonders which You performed through Thy humble servant, Martin de Porres, during his lifetime. We pray that all the world may know of St Martin and of the surpassing value of the virtue of humility. Through the same Christ our Lord. Amen. through mutual benevolence in God, men may increase the fruits of grace and merit the rewards of eternal life. Amen.